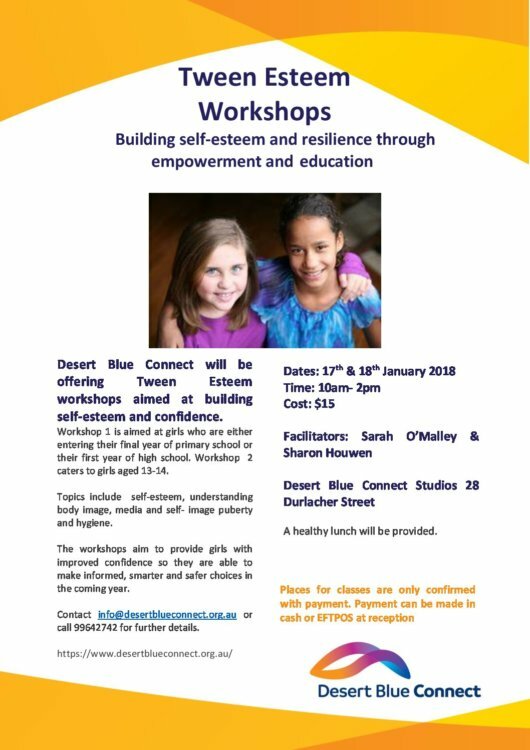 Desert Blue Connect will be offering two Tween Esteem Workshops during the school holidays which aim to build self-esteem and confidence for young women. The workshops will be held on the 17th and 18th of January 2017, from 10am to 2pm. The first workshop is aimed at girls who are either entering their final year of primary school or their first year of high school. The second workshop caters to girls aged 13-14. Both workshops will be held in the Desert Blue Studio, 28 Durlacher Street and lunch is included. Cost is $15 and needs to be pre-paid. Payment can be made at reception with cash or Eftpos. Sarah, Community Educator will cover topics on self-esteem, understanding body image, media and self- image and Sharon, Women’s Health Nurse will provide the information on puberty and hygiene. The girls will be active with games, demonstrations, art and discussion. The workshops aim to provide girls with improved confidence so they are able to make informed, smarter and safer choices in the coming year. Contact info@desertblueconnect.org.au or call 9964 2742 for further details.